LAUREL, Md. 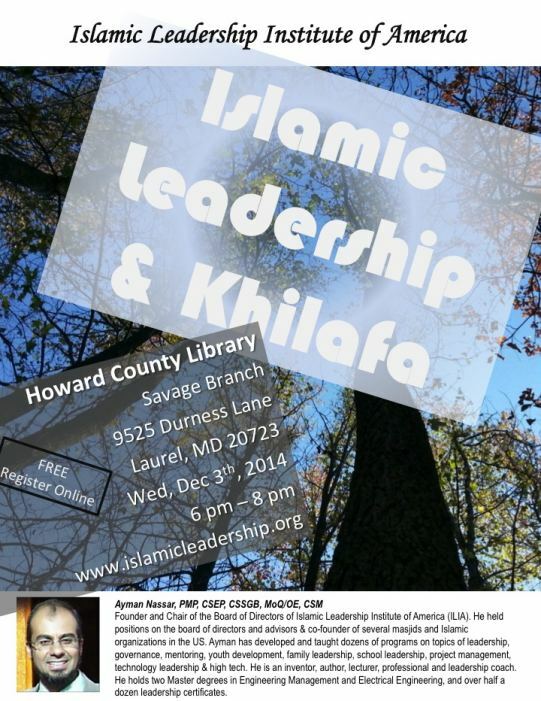 - Oct. 15, 2014 - PRLog -- Islamic Leadership Institute of America is holding a short event on the topic of "Islamic Leadership & Governance" for the general public to clear up some of the confusion that looms in the area with all the developments across the world, involving groups claiming to carry the banner of Islam. Please share on your mail-lists and invite others to come for an educational event at the Howard County Library - Savage. Event comprises of short guest speeches and panel discussion, with opportunity for plenty of questions. Books and papers on leadership in Islam shall be available for display and reference.